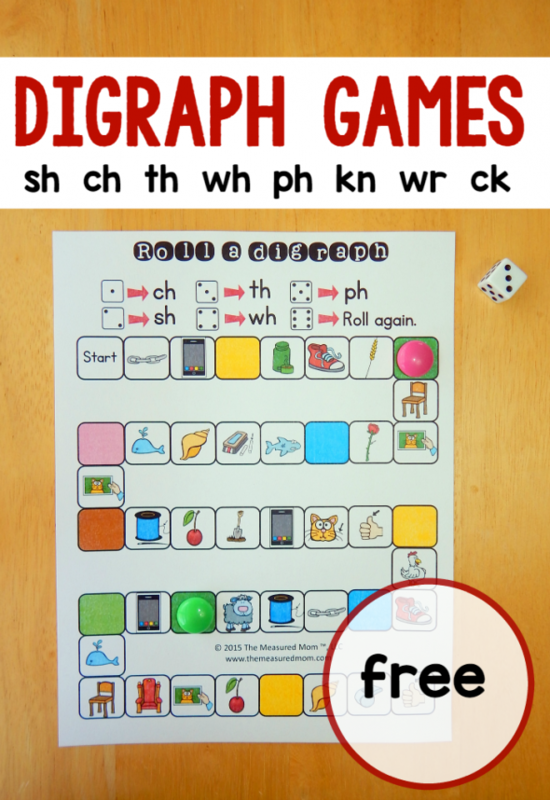 Looking for a game to help your child learn the sounds of beginning and ending digraphs? Today I’m sharing five of them! 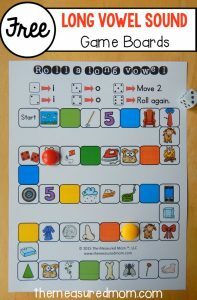 About a month ago I shared a giant set of Roll a Short Vowel games. 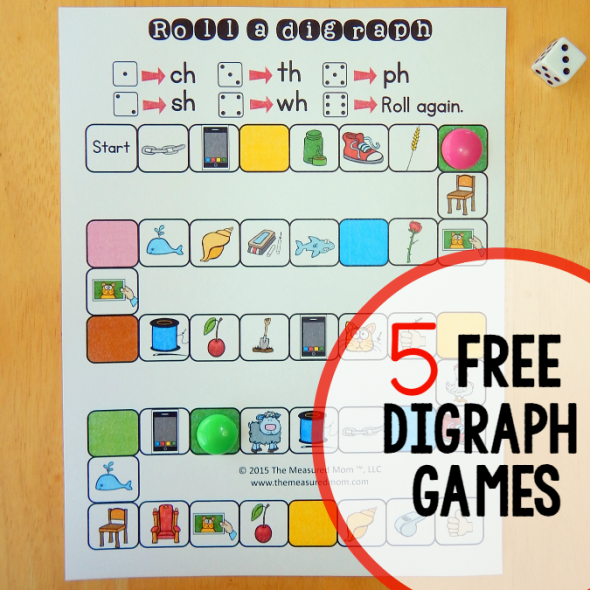 Today I’m sharing five Roll a Digraph games! 1. 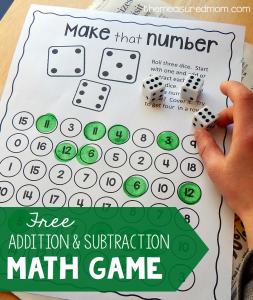 Grab a playing piece for each player and a die. 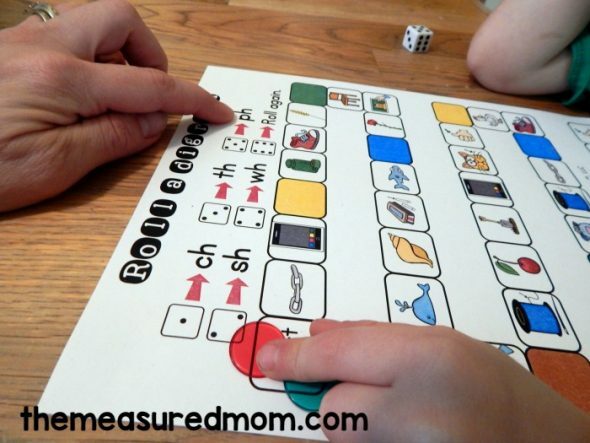 Print the board you’d like to use. 2. Put all playing pieces on Start, and take turns rolling the die. 3. 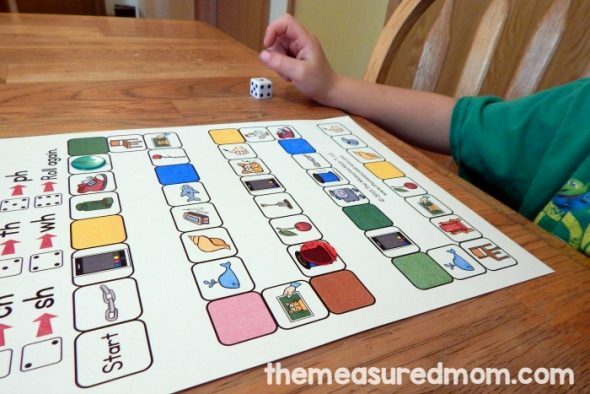 When you roll the die, check the top of the board to see what picture to move to. For example, in the above game, if you roll a five, you would move to the closest picture whose names starts with ph. 4. Keep taking turns until one person lands on the final space. Some of the pictures were hard for my Four. You’ll find a key with the picture names in the download, but it might be helpful to begin the game by naming all the pictures on the board. Your child might need some reminders, but it will keep those tricky pictures from slowing down the game. These games are a win for us because they’re quick and effective. I love that I can just print the board, and my son loves that we’re done with a single game in 5-10 minutes. 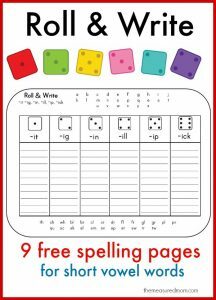 That makes these perfect for a quick review at home or a center activity in the classroom. Looking for more free games? Yay – so glad you use it, Amanda! I have a set coming soon for beginning blends. Your website is amazing. Thank you for more valuable information than I have found ever before! You truly are unbelievable and your website immediately informed me that you are a generous, caring person whose purpose is to meet the needs of others, even when they probably don’t know all they do need or where to find it. Being 12 years older than my brother, I spent a lot of time reading to him from the encyclopedia and he was working on his PhD when he died, leaving an 8 year old daughter that went on to be graduated from Yale Law School. I am sure he would say he is pleased about her accomplishment. Again, thank you for offering to share your freebies and for your earned and learned information that has inspired me to once again put education as a top priority. Your website has shown me new and interesting ways to open doors and opportunities for my great granddaughter by broadening her range of learning and making it a fun and pleasant experience that will be of benefit her entire life. Until now I was doing all I knew to do, and it is by the grace of God that my two children, four grandchildren, brother and niece all have their Degrees of choice. It seemed a hit or miss struggle, (“kinda” like a salmon swimming upstream), but after finding your website, I now feel I have a course and plan of action. It is almost seems like a guarantee of success, since the meager, uncharted course I had used with the others does not compare with the help I feel is coming from you, a compassionate and interested helper. 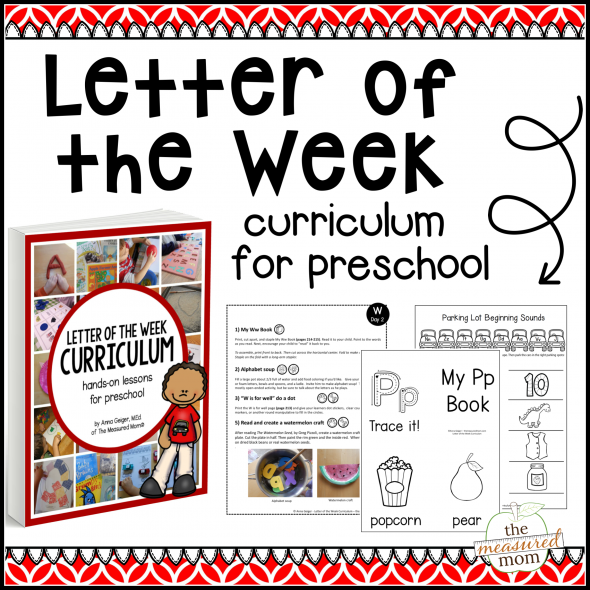 Thank you again for the valuable info you already have provided that will help me guide this little one to a smooth learning process that will make getting an education an easy, enjoyable and natural experience. Thank you so much for your kind words, Betty! Your great grand daughter is very blessed to have you taking such an interest in her education. I hope you keep finding valuable resources here! 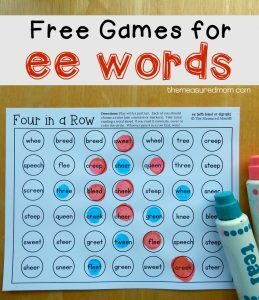 My 7 year old is having trouble spelling words and so we’re giving your game a go as a tool for improving his spelling. We just finished the first game (i won) and he’s asked to play another 3 times. Looks like this game is a winner! These are AWESOME! I can’t wait to play these with my son this week. Thank you. You’re very welcome – have fun with them! I am a tutor and love this website as I address the individual needs of the children I teach. Thank you! Hello Anna!! Great and creative job for small students!! Congratulations!! Thank you so much, Dimitra! Thank you Anna for all of your hard work! It’s so nice that you share your lessons with us all. I’m looking forward to visiting this web site often. Thank you so much! You are amazing! Thank you for all your hard work. I really appreciate these. I am going to be teaching summer school for incoming kindergarten and I needed some great resources. Only just discovered your site. Fabulous. I have some children who have little English. The sight word ones are fabulous for introducing them to our language. I’m so glad you can use my resources! Thank you so much, Anna for your wonderfull games!!! They are so much fun at home with my kids and give very pleasant diversity when working in a class with even 10 year olds learning English as a foreign language. you are so creative and enthusiastic!!! You’re welcome, Jenia! Thank you so much for the kind words! But I tried but couldn’t download the printable no matter how much I tried. What is Opera, Aisha? I’m sorry you’re having trouble. If you can tell me the specific problem, I can try to help. What happens when you RIGHT click and choose “save link as”? Thanks so much for these excellent resources. 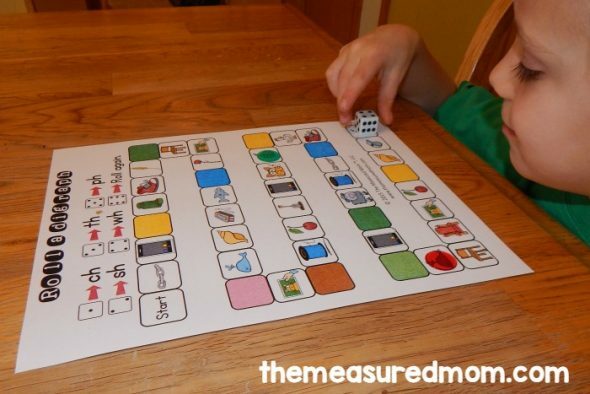 I’m a primary teacher in England and will be using these games with the Year 1 children – they look fantastic! Thanks a lot, was just talking about needing something like this and one google search later, here it is! Your work is great, thanks for sharing! I’m learning so much for your blog and resources. Your activities are incredible, and your explanation of the progression of learning is so helpful. I’m glad this helps you, Mary!